I am reminded of a Sheryl Crow lyric – “What ever happened to modern jazz?” – after watching first time filmmaker, Damien Chazelle’s GUY AND MADELINE ON A PARK BENCH. The answer is certainly not that simple but there are a number of possible theories to be found in the textured grain of this experimental musical that captured the hearts of the Tribeca Film Festival patrons when it premiered there in 2009. It has now captured the heart of actor, Stanley Tucci, who presents it to you in a limited theatrical release. Now, there is no need to be frightened of the word, “experimental” – or “jazz” for that matter – in this case, as some tend to run when they hear these words. In fact, the reason the film has been so well received is because it captures the beauty of these sometimes intimidating concepts so naturally that you wonder why you were ever hesitant to begin with. What began as an undergraduate thesis at Harvard, GUY AND MADELINE (as it is affectionately shortened to for convenience purposes), grew into what Chazelle describes as his personal take on the musicals of the 1930’s and 40’s, which he had been obsessing over at the time. Citing specific influences like THE BAND WAGON and MEET ME IN ST. LOUIS, Chazelle pitched his thesis as a real life musical; people would still break out into song and dance but it would be grounded in a context that could be universally understood. The classic Hollywood musical is not the only genre being played up here though; Chazelle was also fascinated with the French new wave cinema of the 1960’s and 70’s, from Jean-Luc Godard to Jean Eustace. The combination of the two drastically different approaches is what makes GUY AND MADELINE so distinctly unique and according to Chazelle, balancing between the two was certainly tricky. Guy and Madeline (fresh faces, Jason Palmer and Desiree Garcia) have it rough from the start. Heralding from Boston, these two lovers of both music and each other are introduced to the viewer as happy and then torn apart before we can even get a chance to be happy for them. Still, as they both proceed to stumble around somewhat aimlessly in the wake of their brief but powerful time together, your heart goes out to them and you can’t help but wonder what went wrong. And what better way to explore the complicated nature of emotional turmoil than through song? Without a Hollywood sized budget, the musical numbers in GUY AND MADELINE have to rely on plain old fashioned talent, which, after scouring Boston’s music scene, Chazelle found in Palmer in Garcia. Garcia was pursuing her PhD on musicals at the time and was already entrenched in the tap dance scene so she was a natural fit but Palmer doesn’t actually sing. 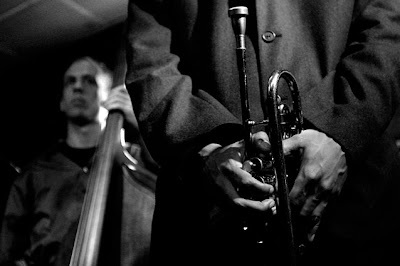 His musical contribution is a beautiful and delicate trumpet. The musical is inherently out of step with reality but yet it continues to be made and it continues to honour the same values it did when it was originally conceived. Back in the day, when a character needed to deal with a love that is lost, they would saunter through a park and lament to the moon; when that love is reaffirmed, the whole cast breaks out into dance. In GUY AND MADELINE ON A PARK BENCH, the aesthetic is decidedly different but the sentiment is the same. This is perhaps why the musical has survived all this time despite its detractors; perhaps beneath all of our meandering cynicism, we are all still romantics at heart. 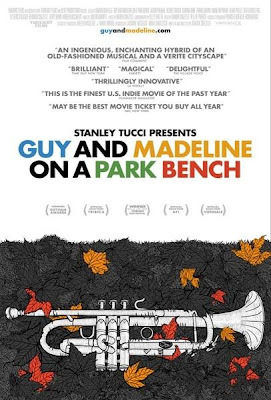 Damian Chazelle is already at work on his next screenplay and GUY AND MADELINE ON A PARK BENCH is playing in select cities right now. If it’s playing in your city, treat yourself.